I’ve been practicing Aikido for 12 years and have learnt many amazing things including Ki Breathing from my Sensei. We often do Ki breathing for a small amount of time in an Aikido lesson but the real benefit comes from doing it everyday or when you are stressed or ill.
Ki breathing involves slowly breathing in and out from your centre (Hara), which is located 2 inches below your naval, whilst imagining a flow of Ki (life energy) entering and exiting your body with your breath. It has an excellent calming effect, especially when combined with a meditation, and helps to keep you healthy or heal you if you are unwell because of the increased flow of Ki (and oxygen) to the whole of your system. 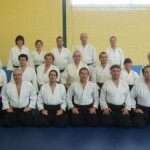 – Ideally you should sit in a kneeling posture called Seiza (the front row of black belts in the photo below are sitting in Seiza. That’s me second in from the left at the front.) However, if you have not sat like this very often, it will probably quite painful so you might want to start like that and then swap to cross-legged. Keep practising sitting in Seiza until you build up endurance. – Make sure that you are relaxed but not slumping; feel dynamic and alert. – Close your eyes and take a big breath in to start. – Breathe out slowly through your mouth making an “ah” sound, like you’ve just had a sip of a nice cup of tea. Your mouth should be quite wide open and the ah sound should be long and steady. The sound is made so that you know your breath is consistent. – As you breathe out imagine Ki (energy/life force/spirit) from your centre travelling up your body and exiting your mouth and going onwards and outwards to infinity. Also feel any negative energy, feelings, worries or illness leaving your system. – When you have finished breathing out lean forward slightly and imagine that you are still breathing out for a few seconds. – Then close your mouth and breathe in slowly through your nose. The temptation will be to suddenly inhale a lot of air but you need to control your mind and body so that you do it slowly. – As you breath in imagine Ki from the Universe flowing down into your centre, healing and revitilising every cell in your system and filling you full of positive fresh energy. – When you have finished breathing in lean back up to the starting position and imagine that you are still breathing in for a few seconds. – Then repeat at least 10 times. This may take quite a while because ultimately you should be aiming at 45-60 seconds for a complete cycle, but that may take a bit of practice to achieve. – Always finish with an out breath, just breathe naturally after that. You may want to finish off with a meditation of your choice because you’ll be in a particularly receptive state. After you have finished the Ki breathing, just slowly become aware of your physical body once again and then slowly open your eyes and become aware of your surroundings. You may feel quite spaced out but you should feel very relaxed, calm, happy and alive! This entry was posted on Thursday, August 6th, 2009 at 7:11 am and is filed under Positive Thinking. You can follow any responses to this entry through the RSS 2.0 feed. Both comments and pings are currently closed. Jake, that’s a very nice intro to breathing exercises! Definitely something to try. Especially for programmers, who, after hours of wrestling tech problems in their mind, end up with tense body and very poor breathing, thus lacking energy. @Juuso: Now that’s a good idea!